Okay, so you're hooked on the sublime guitar riffs of the late, great Ali Farka Toure and his son Vieux. And you've dug into the gritty rebel songs of Tinariwen. Where do you go from there to discover more of this achingly sparse style? 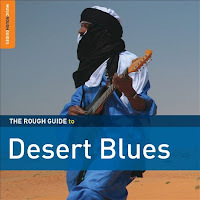 Look no further than The Rough Guide to Desert Blues. The compilation kicks off with Terakaft, a group whose name means "caravan" in Tamasheq, the language of the Taureg people of the North African Saharan desert. With clangy electric guitars playing overlapping lines, it's a great intro to one of the distinctive sounds of the area, and similar to the Tinariwen track "Tenhert" also included here. The desert has more musical flavors, however. Many of them take the slow road, their beat the footsteps of a camel conserving its energy (though apparently the guitar/ngoni/fiddle player riding on his back is feeling more energetic in laying down solos!). Mauritanian singer Malouma brings a smoky jazz/blues club feel to "Yarab," while Mariem Hassan from Western Sahara sounds like she's singing to a broad sky full of stars on "Tefla Madlouma," accompanied by sparse guitar, rhythm, and backup singers. Also in the mix are tracks by Bassekou Kouyate, Tartit, Amadou & Mariam, and Etran Finatawa -- all of whom have found some level of success in the broader "world music" market and beyond. Perhaps less well know are Samba Toure (formerly a member of Ali Farka Toure's band), the raspy-voiced Jalihena Natu, Mamane Barker (master of the five-stringed lute known as biram), and the Tinariwen-tutored group Tamikrest. 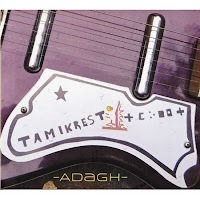 Tamikrest, whose name translates as "junction, connection, coalition, or knot," is led by singer/composer Ousmane Ag Mossa. Like many of the other artists on this CD, he writes of the hardships of daily life in the desert, and their aspirations to overcome prejudice and political repression. When Taureg children arrive in the public Malian schools, they are soon confronted with an administration that refuses to see the realities our people suffer. The youngsters are subject to racism and marginalization every day at school. Our hope is to have the world listen to our revolutionary songs, which reflect the harsh life coditions that our people endure. The compilation comes with Introducing Etran Finatawa as a companion CD, and most of the other artists have albums available, so it's easy to quench your curiosity with more desert tunes.